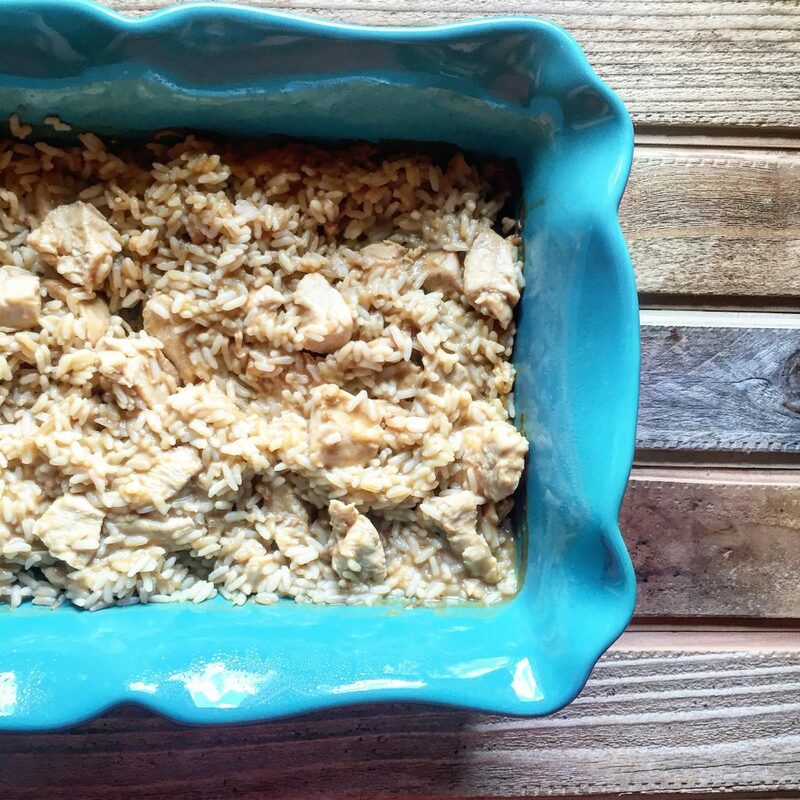 When I was growing up, my Mom’s Chicken and Rice Casserole was an absolute family favorite in our home. We couldn’t wait for mom to make Chicken and Rice! It’s probably one of the most simple recipes out there, but she made it very seldom. I think because she wanted to keep it special. Also, My dad was the definition of a Midwestern Meal lover/eater- “Meat & Potatoes.” and to be more clear, red meat and potatoes. I don’t recall many meals having chicken or turkey, but he sure loved this one. When I was older and began sharing the cooking responsibilities for the family, I remember hiding ground turkey in meals in attempt to fool him, and often I did… I think. Eric thought that I was such a terrible person for fibbin’ to him about the ground beef actually being ground turkey. But I’m sure he probably knew deep down and didn’t care, because I made sure it was delicious. I miss that stubborn man like crazy. This is actually a recipe form my Grandma Lois, possibly even my Great Grandma, Hattie, which I found out later while when telling my mom I had lightened it up a bit in order to make it more Weight Watchers Friendly. My mom remembers growing up and fighting with her brothers over the “crispy edges” of the rice that formed in the corners while cooking in the oven. Unfortunately, in the lightened up version I’ve lost those crispy corners a bit, because I’m guessing those corners were in fact fat that drained off the bone-in chicken. I’ve decided I’m also going to post the original, not-so-healthy recipe later on, because it’s too good too pass up. My lighter calorie version sure hits the spot though! Of course, I had to bring my mom a couple helpings to make sure that it passed the test. She said it tastes just like how she remembers it, despite lacking those dang delicious crunchy corners of rice! You might look at the photograph and think it looks kind of plain and simple. And that’s the thing- it really is pretty plain and simple, but it’s so good! I’ve tried to add some more vegetables into this, but either they don’t cook correctly, or the rice doesn’t cook just right. The ratio is perfect, so I suggest steaming or roasting some veggies of your choice on the side to complete the meal. 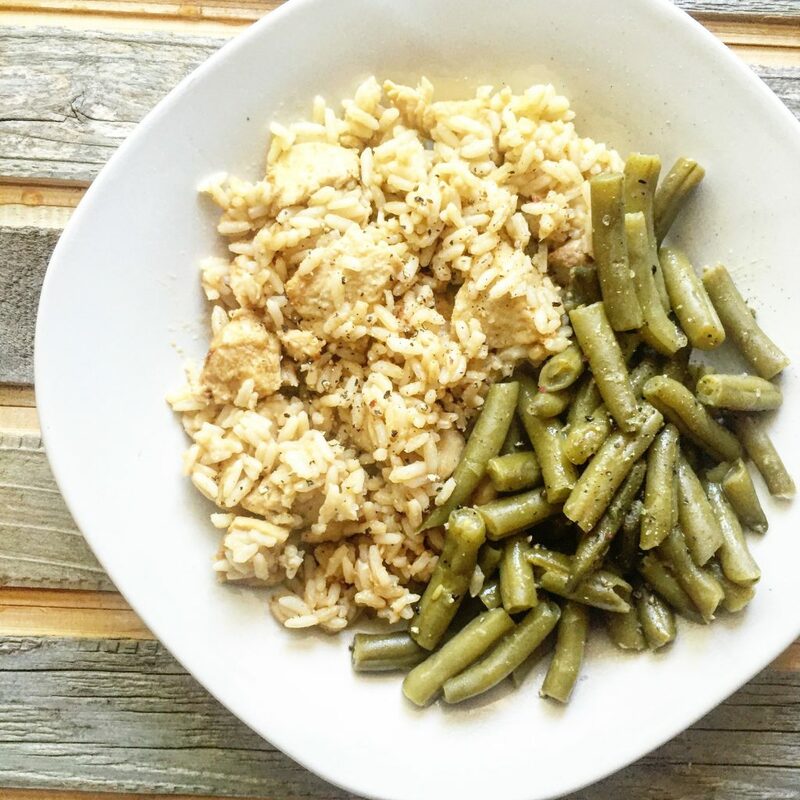 I grew up on a can of green beans on the side with this dish, so that’s my favorite way to eat it. Sometimes out of the can tastes just perfect! Cut up the chicken into uniform small pieces. 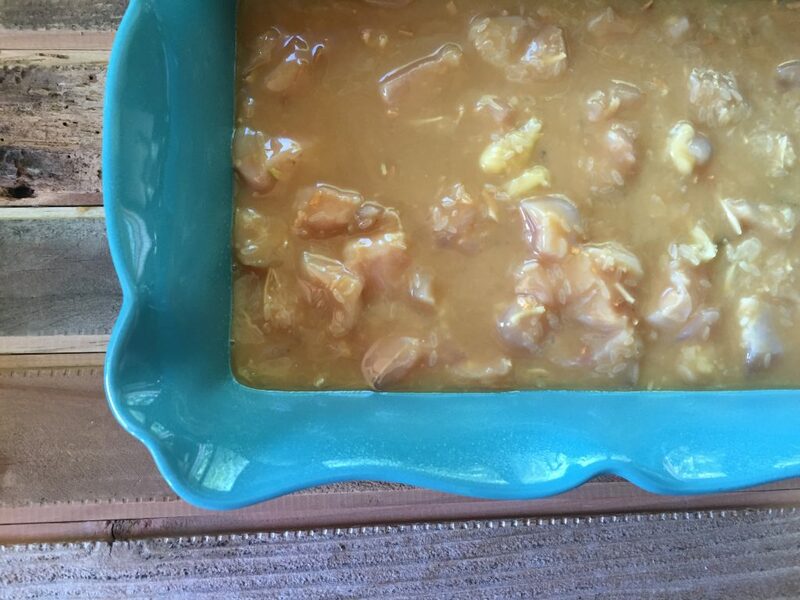 Grab a big bowl and add all the ingredients… chicken, can of soup, a can of water, rice (just regular old White Rice – NOT Minute or Instant Rice), and the packet of french onion mix. Mix together well until combined. Pour mixture into a lightly sprayed casserole dish. Cover with aluminum foil, and pop it into a 350 degree oven for 1 hour. You MUST cover tightly with aluminum foil in order for the rice to cook properly. It’ll look something like this. Simple… but OH SO DELICIOUS! 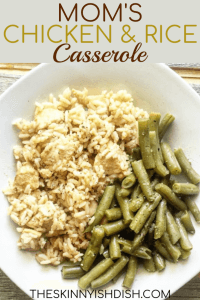 Scoop it up on a plate with some roasted veggies or my personal favorite, a can of green beans! Salt & Pepper, if desired. 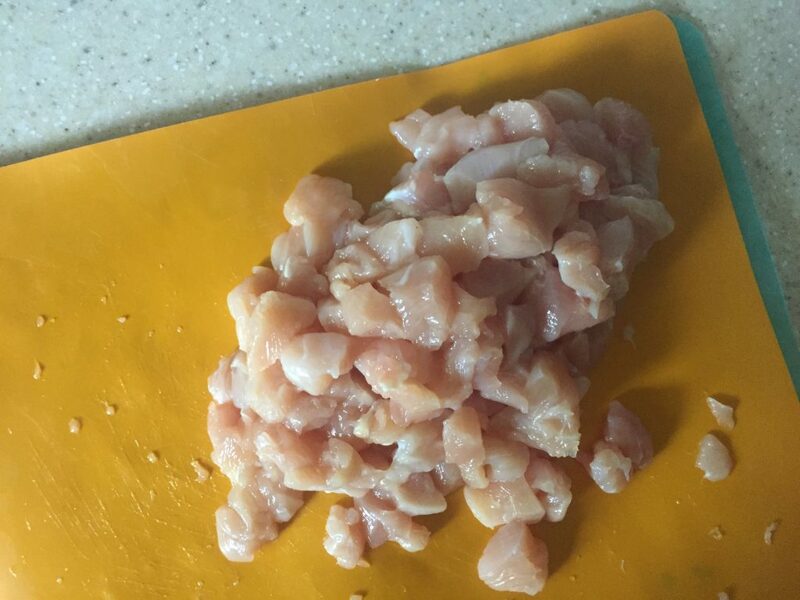 Chop up chicken breast into small, uniform bite-size pieces. 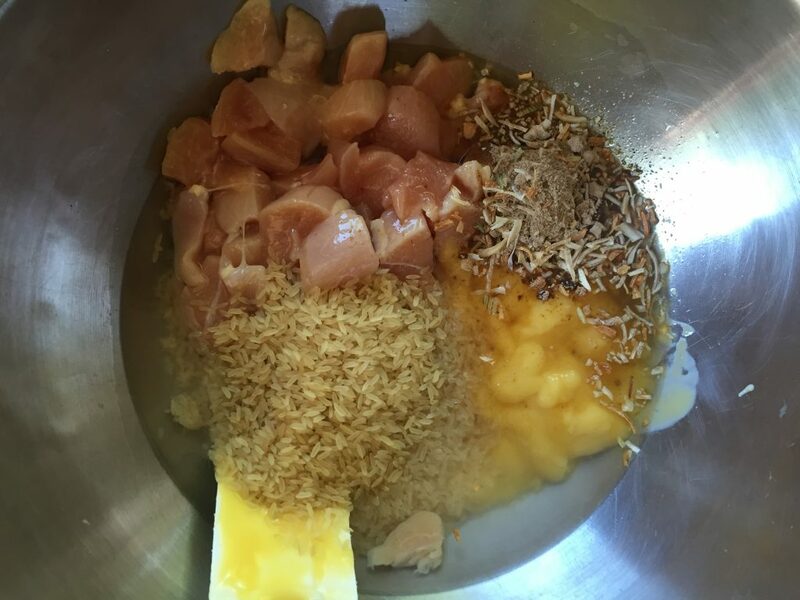 In a large bowl, add chicken breast, soup mix, cream of chicken soup, water, and rice. Mix well until combined. In a lightly sprayed casserole dish, add the chicken and rice mixture. Cover with tin foil. Place into the oven for 1 hour. After removing from the oven, Salt & Pepper to taste, Serve and Enjoy! Made this last night for dinner and my fiance said that he thinks this is one of his new favorites! I have been trying a lot of new recipes since joining Weight Watchers 6 weeks ago and this has honestly been one of the easiest dishes I have made! I was surprised that 1 serving was only 3 points (and that was me adding and additional 1/2 cup of rice). Plus, I am always a big fan of meals that I can get a leftover lunch for the next day! Just made this tonight. Easy and delicious. I paired it with a nice salad. You can totally use cream of mushroom or cream of celery! I hope you love it! This was a total hit tonight! Loved how it’s comfort food without all the extra point. Is there a certain brand of white rice you prefer to use, that’s lower in points? I used Uncle Ben’s but it made mine 5 freestyle points per serving instead of 4. 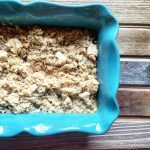 This recipe is delicious and easy to make! It’s a family favorite! So happy you enjoy, Amy! Thanks so much for letting me know! Cn this be made with minute rice? Hi Sarah, no it can’t. If you use minute rice it will turn to mush. I have made this several times and after cooking as the recipe directs the rice is still a little hard and it looks burnt/dry on the edges? Can you suggest anything to help? try adding an extra half cup of chicken broth or water. That should help a bit! I tried this recipe tonight, and my husband and I loved it, but the onion soup mix was a little strong for us. Neither one of us cares for onion. Can you recommend something to replace the soup mix? Thank you! I’m glad you liked it! I’d just use some spices that you do enjoy- It doesn’t need to be a soup mix. Looks yummy! Have you made this with your homemade condensed soup.. or I’ve seen kind of the same thing wih Greek yogurt and chicken stock! Yes I have made it with my homemade soup. Super yummy. I have not however made it with chicken broth & greek yogurt. Hello! What are your thoughts on adding frozen peas to the mix before baking? Excited to try this! Thanks! They may get mushy because it’s a pretty long cook time. I would add them after it’s done, personally. Hope you love it! My family loved this, even my picky 9 year-old. I used brown rice and it turned out great! Good to hear! Thanks so much for letting me know! My husband LOVED this. In fact, when he tried it, his response was “Holy S***! That is good.” I made it last week for lunches, and he just asked when we can have it again because he can’t stop thinking about it. Haha! So happy to hear he enjoyed this!! Hi. I bought uncle Ben’s instant rice by mistake. If I use that will the recipe still come out OK? Some people have used instant rice and said that it turned out just fine, but I have always had a tough time with the instant rice in my personal experience. I hope it works! Did you cover your casserole dish tightly with foil? I’m only cooking for one and thinking about halving this recipe tonight. Have you ever tried? Do you think the cook time would be less? Thanks! I have not tried halving this recipe. I’m sorry! I do know rice can be a little finicky when not using exact amounts. So I hope it worked out for ya! I do know people have frozen this and enjoyed it reheated. Hope you enjoyed! I don’t have a instant pot. I’m just not one to have many appliances. 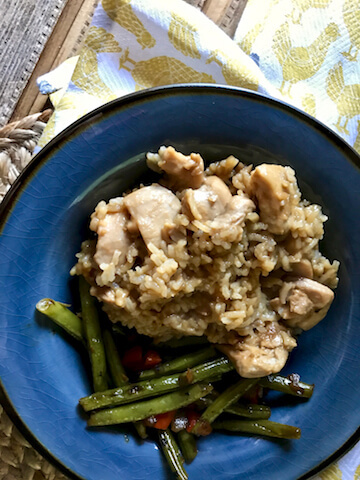 I feel like I have seen a couple people do it in the instant pot and had success! Enjoy! Is the rice plain long grain? Not minute right? If I use brown rice instead of white do I need to cook it longer? I haven’t tried it with brown rice, but you shouldn’t need to. I’ve seen other people substitute it with different rice. Just to be sure when the hour is up take a tiny spoonful and test it out. If it still seems like it has a bite pop it in for a bit longer. I hope you enjoy! I have Lipton Beefy Onion soup mix instead of plain Onion Soup mix. Have you ever used this? Think it will substitute ok? I’ve never used it in anything. so I can’t say with confidence what it would taste like, but I assume it would taste just fine! This is the third recipe that I have tried from your site and I have loved all of them. I wasn’t sure about the onion soup with the chicken, I have only used it in beef recipes, but – wow! It was really good. I am searching the archives for more to try. Thank you! Hi! Have you ever made this with yellow rice? My husband is a fan of yellow rice so I was hoping I could make it happen. I LOVE all of your recipes! Thanks so much! Hi! Have you ever made this with yellow rice? My husband is a fan of yellow rice so I was hoping I could make it happen. I LOVE all of your recipes! I have not, but other people have tried different types of rices! I’m sure it would taste delicious and as long as you use the same quantities it should bake up the same! Do you think I could add carrots to the mix before putting it in the oven and have it cook all together? I have a 2 year old and she is super picky when it comes to vegetables, so I have to hide/mix things together. She will not so willingly eat veggies on the side. I might just add some baby spinach at the end and mix until wilted. I cant wait to try this! I’m sure it would be okay, maybe add a little extra water! Would this work with shredded chicken already cooked?? I have never tried it that way because my guess would be that the chicken would dry out being in the oven for a hour. Baking the chicken along with all the rice and seasoning ensures super moist and flavorful chicken! I have never tried, Sorry! Hi! Do you think this would freeze well? If I mixed all the ingredients and froze? Hi Ashley! I’ll admit I have not had a chance to test this one in the freezer yet because it goes way too fast in this house. It more than likely will, you may need to add a touch of chicken broth when reheating. I will make a note to freeze a batch super soon! Where is your casserole dish from? I love all of your cookwear and dishes! What size casserole dish do you recommend? This is soooo good!! I follow you on IG which is what led me to your blog, and this is the first recipe I’ve tried of yours. It was fantastic! 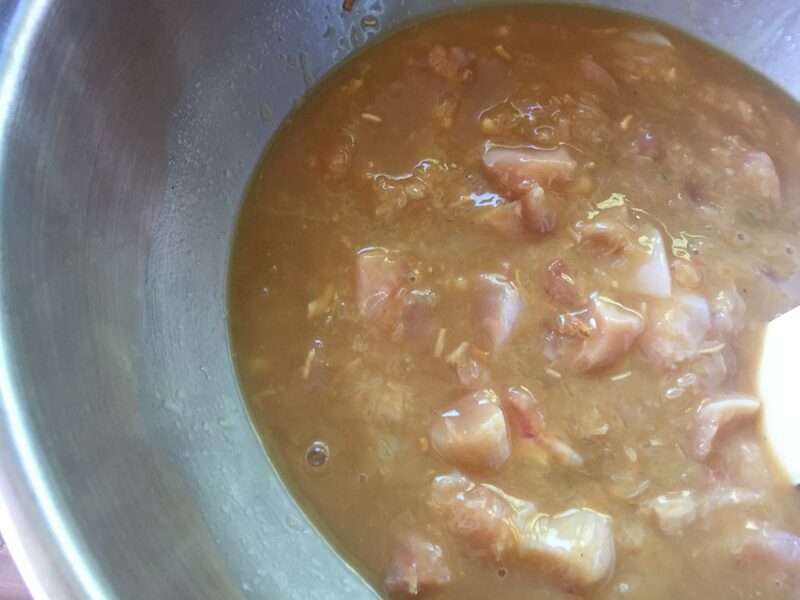 I tweaked it just a bit with low fat soup instead of fat free, and used boneless, skinless chicken thighs instead of breasts. It still worked out to 6 SP for 1/6 of a serving- I ate more though cause it was so darn good! Thanks so much for the recipe. It’ll be a regular in my house! I’m so happy to see that chicken thighs work out to be the same points! I didn’t even try that because I figured it would be a bit higher, but chicken thighs are what is used in my mom’s original recipe so I am super excited to make this with them next time! So happy you enjoyed it! I’m getting ready to make this….when I put it in the recipe builder I’m getting 8 smart points per serving at 6 servings, not 6 smart points…. Be sure that you are counting 1 cup dry rice, not cooked rice. Enjoy! Hi! I made this and it was super yummy! I follow Points Plus, and when I put in the nutrition stats I come up with 6PP per serving but you have 3. Wondering if I didn’t do it right? Thanks! I will double check. I might have made a mistake! I’ll get back to ya. I’m happy you enjoyed! Hi Kylee! I just checked. It’s 6 Points Plus. I must have just simply forgot a number when plugging it in to the points plus calculator! Sorry about that. It’s all fixed now! No problem, just thought I did it wrong! It was so good, & filling. Thanks! Do you have printer friendly versions of your recipes? Am I just missing them? Thanks! Can’t wait to try out some of your meals. Just found your. Log through a friend on Instagram. This was a hit! We made it on a freezing cold night and it just hits the spot when you need comfort food. I am so happy you loved this! I couldn’t agree more. This was a meal that I grew up on and it is the definition of comfort to me. AND it’s one of the easiest things to put together when you’ve got a lot of other stuff to do! Delicious!! Great for weekdays when I don’t feel like cooking because it’s so easy. Another one of our favorites. I always have the stuff for this on hand because of that exact reason. Some times the day just disappears, but I know this can be made in an hour and completely satisfy all of the hungry bellies! Thanks and I am so happy y’all enjoy! Hi! The rice is uncooked before putting it in the casserole correct? Just made this and it turned out delish! The only thing is my recipe had only 4 cups instead of the 6. I followed recipe, will the points be different ??? Yes! I will for sure be posting the original in a few weeks. It’s honestly not that terrible, it just has the bone in chicken with skin that adds a lot more points! Enjoy! Can’t wait to make this. I think my Mom made the same recipe. The only thing I see different is that you used the 98% fat-free soup in the “lightened up” version. Is that right? Got it! I think my Mom always used breast meat so I didn’t even notice that was changed! Thank you! Love your blog! This reminds me of Kansas winter food. Yum! How many smart points per serving? 6 Smart Points! Yes it sure is delicious comfort food! Ok, I didnt think so! Hope it gets fixed for you soon!